The backyard drops away from where our house sits on the hill. Because of that, our view from our windows is at, if not treetop level, certainly a tree-house level. From the bay windows around our kitchen table, I can watch birds while I eat. Since I spend a fair amount of time doing that on a daily basis, I witness things in the woods I might miss were I not watching. 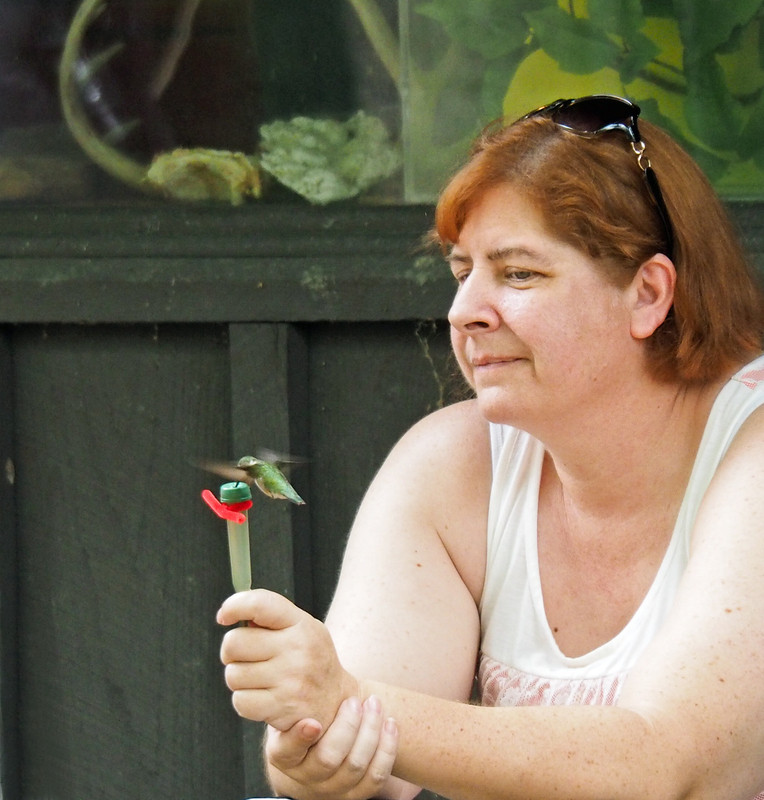 Like this little hummingbird, for example. 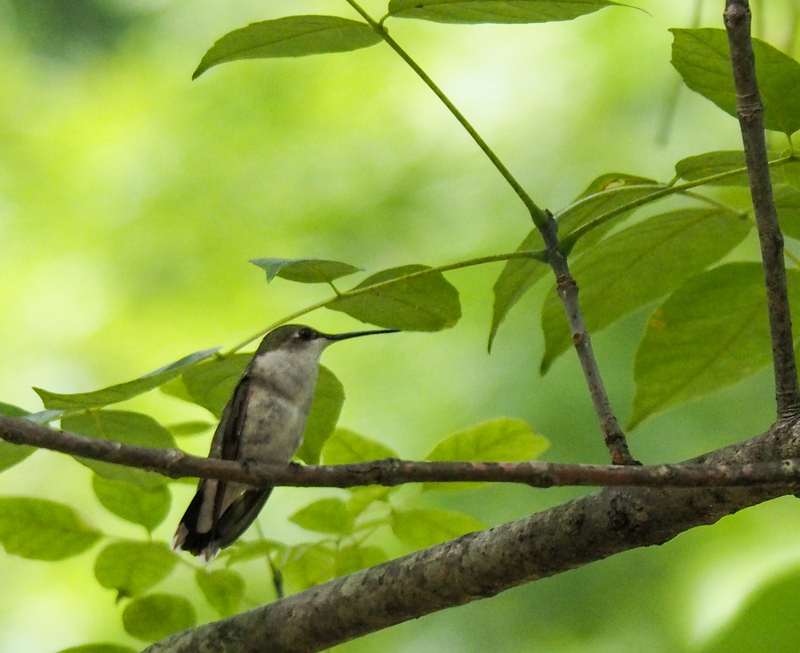 The little humming bird is perched on the sycamore tree in the center of this photo. I wanted to get it’s picture so I zoomed in with my camera, but the little lady wasn’t there. I didn’t realize it immediately, but you may have guessed. She was making a nest. It looks more like a nest when she is sitting on it. She doesn’t rest there long. 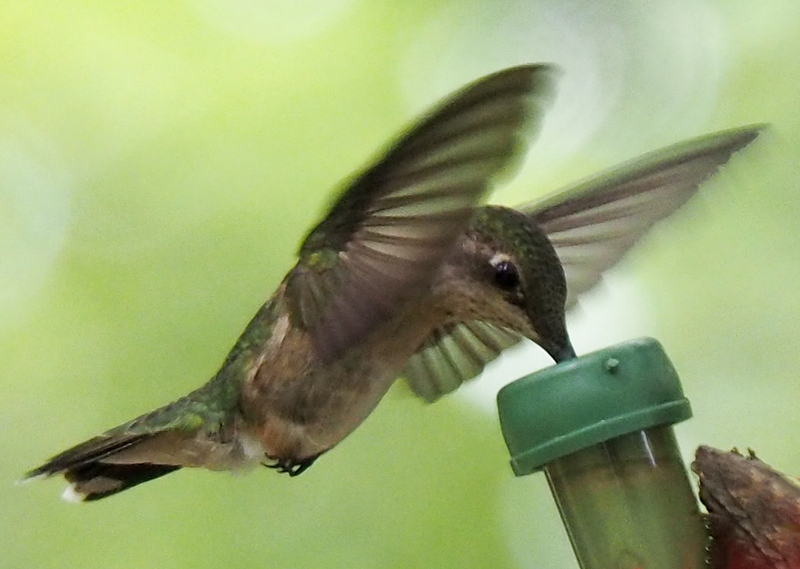 Hummingbird with cottonwood seed fluff. or spider webs, that you can just barely see if you look below her beak. Then she has to tuck everything into the nest she’s building. By the end of the day, she had made the nest cozy and comfortable with the soft white cottonseeds. I don’t know if she spent the night there or not. 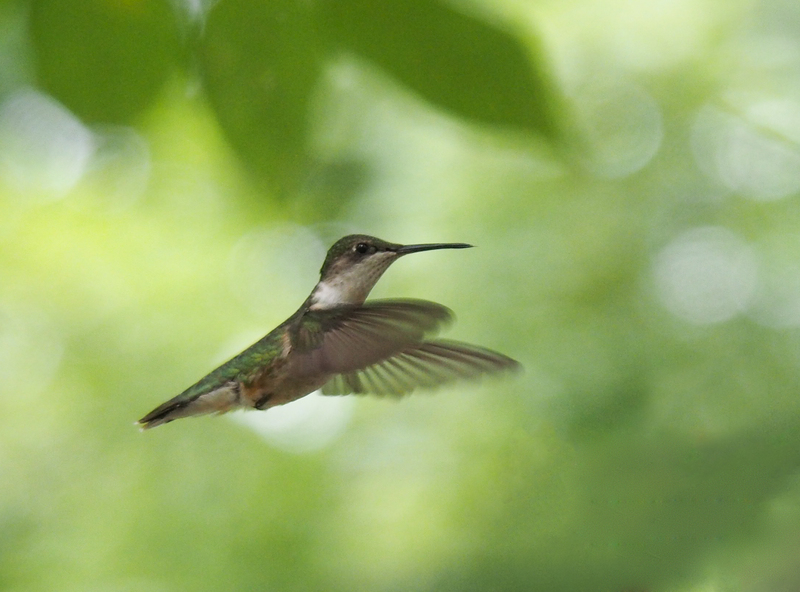 According to rubythroat.org, after the hummingbirds mate, the male and female have little or nothing to do with each other. She will be a single parent. A day or two after her nest is complete, she will lay two pea-sized eggs. Occasionally there may be only one, but she knows better than to try to manage feeding three on on her own—so usually only two. Incubation lasts about two weeks. I should be able to tell because during this time period she will be on the nest 50 to 55 minutes every hour. When the chicks hatch they are about 2 cm in length and not able to keep their bodies warm. The mother still stays with them, but leaves the nest for quick trips to find food which may be nectar, pollen, and tiny insects. The chicks will stay in the nest about three weeks. I’m really hoping to shoot a photo of the mother feeding the babies. After dinner, Mark and I sat on our screened in porch, also at tree-house level. We saw a young doe, and then later a young buck, wander along the creek just inside the woods at the bottom of our yard. We listened to bird calls, occasionally hearing one we didn’t recognize. And watched an occasional flash of red in the trees as a cardinal found its perch for the night. I feel fortunate to witness some of the wildlife here that shares this woods and this planet with us, and I wonder at all that I miss while I’m not watching. 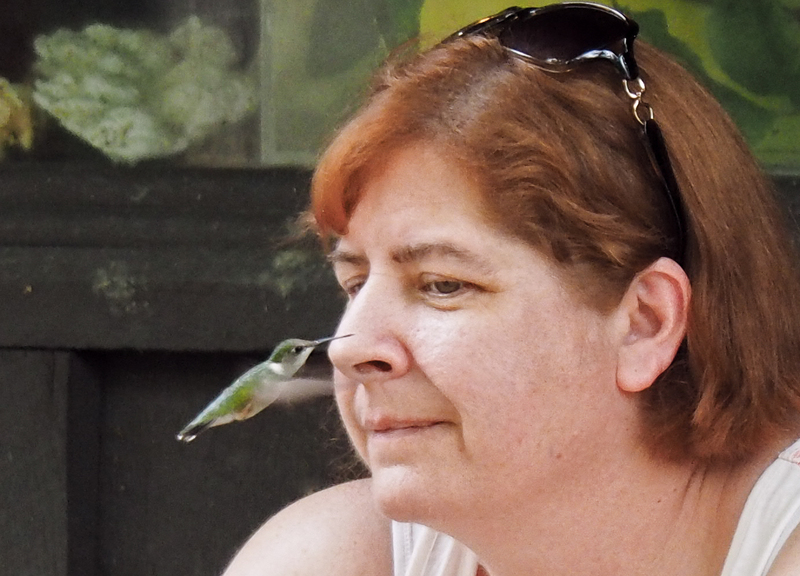 This woman was the picture of patience, and it paid off. I wish I could have reached her before she left. I would have sent her the photo. Whoah. Incoming. She sure kept her cool. I’m not sure I could have. 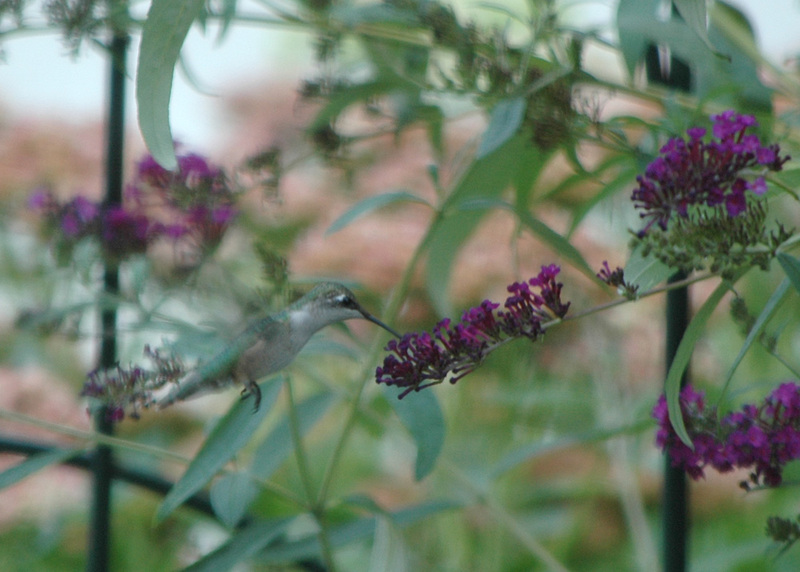 When the first hummingbird I ever saw, years ago, as it was zipping through my garden, buzzed by me, I ducked, thinking it was a very large insect. What do you think? Insect or bird? Maybe insect. Or maybe magical, winged, woodland creature dancing with the fairies. I suspect she thinks so. 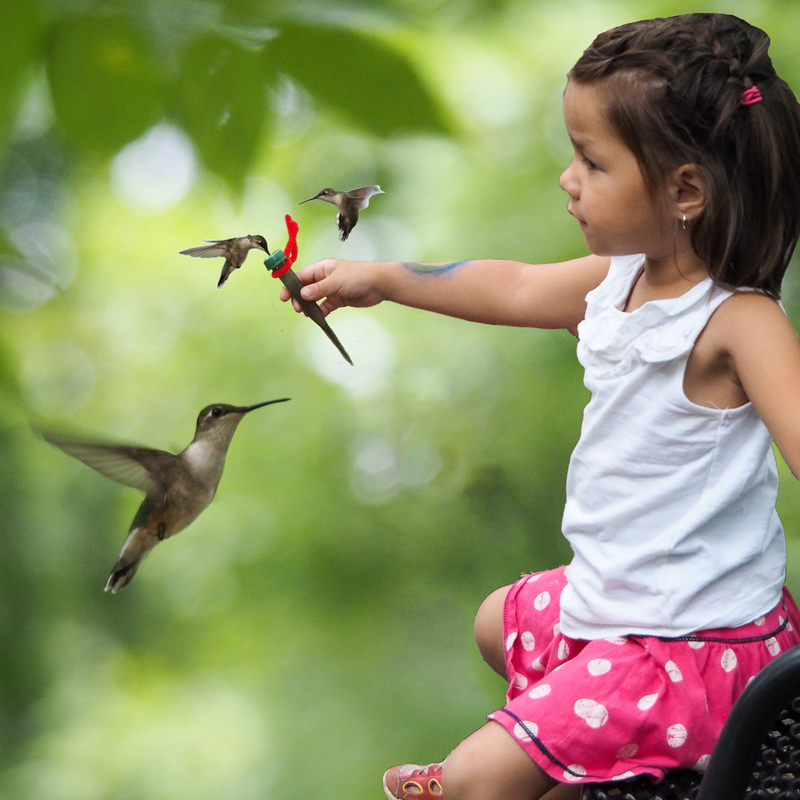 I thought she deserved a hummingbird or two or three, even if she wasn’t patient enough to ever get one without a little help from Adobe Elements. 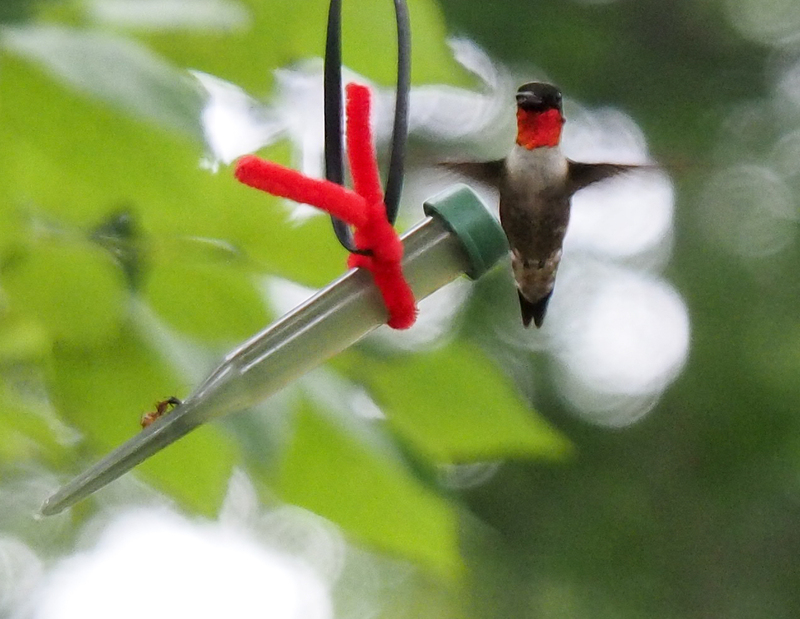 I distinctly recall the first time once of these little hummers buzzed past me. I jerked back a step and made myself small, thinking it was a very large bee, or hornet, or at least an immense, undesirable flying insect. Now I watch for, and celebrate, these little charmers as they dart about my yard from the Mandevilla to the Butterfly Bush to sip the nectar. You are always welcome here tiny bird.